Brian Kaner presents a $2,500 scholarship to Lincoln Tech student Joseph Medina. Photo provided by Icahn Automotive. Icahn Automotive unveiled renovated classrooms and hallways at Lincoln Technical Institute’s (Lincoln Tech) Philadelphia campus as part of its expansion of the national “Race to 2026” initiative. 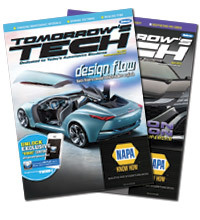 Race to 2026 is designed to invest in and support promising future automotive technicians, as they make their way from the classroom to the service bay, according to Icahn Automotive. The “Race to 2026” program was announced recently at Universal Technical Institute’s (UTI) NASCAR Technical Institute in Mooresville, NC. Additional Icahn Automotive-sponsored learning facilities will be established at other UTI and Lincoln Tech locations nationally, as well as at Alfred State College of Technology. 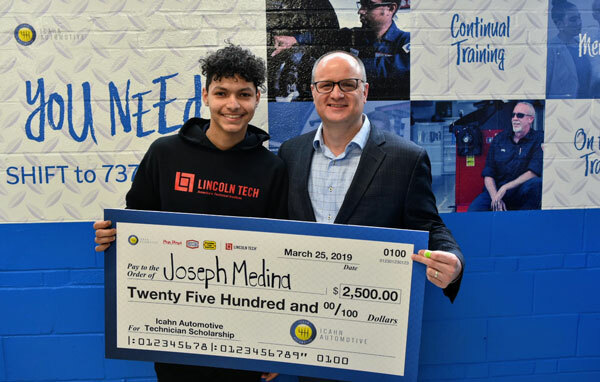 The initiative also includes a scholarship program that will award 12 scholarships to full- or part-time students enrolled in an automotive technician degree and/or certification program at a high school, college or trade school. Applications will be accepted from March 1, 2019 through April 30, 2019. Recipients will be announced in June 2019.